LPH became a part of the National Communication Association in 1988, and the association’s official honor society in July 1995. It is a member of the Association of College Honor Societies (ACHS). The Health Communication Student Organization (HCSO) is a SDSU-recognized undergraduate student organization. The purpose of HCSO is to provide a platform for serving student interests related to health communication engagement and careers. Although open to all majors on campus, the club focuses on supporting health communication majors as they prepare to enter the field of health communication. HCSO strives to create opportunities for members to network with communication peers & faculty, engage with health communication employers, prepare for the post-graduation job market, and give back to SDSU & the San Diego community. Undergraduate students interested in joining HCSO should e-mail healthcomm.so@gmail.com to join the ListServ. Everyone is encouraged to follow HCSO events and activities on Facebook: SDSU Health Communication Student Organization. 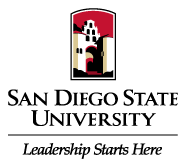 The Society of Communication and Leadership aims to improve the experience of the students of San Diego State University’s School of Communication program. It aims to bring together graduate student, teaching assistant, and faculty members to produce a fulfilling and worthwhile experience that teaches and expands the knowledge of each person involved. SoCAL promotes the graduate learning experience through scholarly events, community service, and social events.